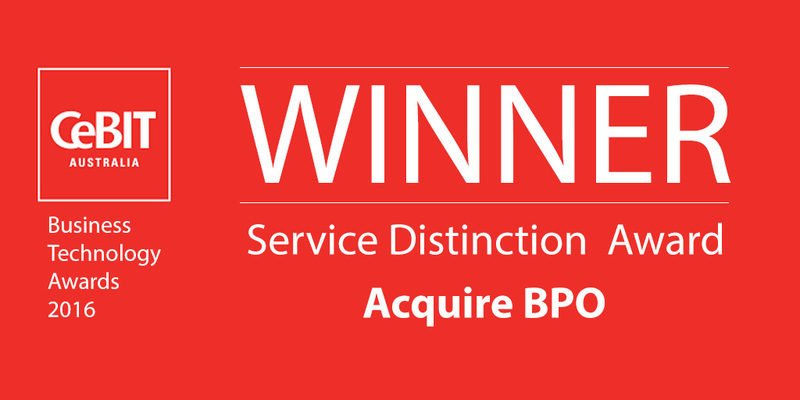 Acquire BPO was presented with the Award for Service Distinction at the 9th Annual CeBIT Australia Business Technology Awards held on Tuesday, 3 May 2016, at Sydney Olympic Park. Held during the CeBIT Australia conference, the gala dinner and award ceremony recognised excellence, innovation and achievement in the information and communications technology industry. Acquire’s General Manager – Sales, Russell Stephens, accepted the award on behalf of Chief Executive Officer Scott Stavretis. The Award for Service Distinction honors organisations that have delivered specific products or services that have provided positive outcomes to customers. Finalists for this year’s award included M2M One, Shippit, WatchGuard Technologies, Rundl and Integrate AV. Previous winners have included Rackspace (2015), KORE Wireless (2014), iiNet (2013) and AAPT (2012). Today, 5 May 2016, Stavretis will be speaking about the benefits of offshore outsourcing at a business forum hosted by the IT and Business Process Association of the Philippines (IBPAP). The event is taking place at the Ernest & Young offices in Sydney. Acquire BPO is a global business outsourcer that offers purpose-built contact centre, BPO, marketing, animation and IT and professional solutions through visionary leadership, onshore client services teams and an experienced workforce of 7,000 across 12 leading-edge facilities in Australia, the Philippines, the Dominican Republic and the US. Learn more about our award-winning capabilities at: https://acquirebpo.com/solutions/.